While the literature of mysticism describes many different "states" of religious emotion and divine awareness, the travel analogy brings with it a whole different set of associations than the term state. State implies something static where a particular layer of the mind or cosmological space is entered and maintained. 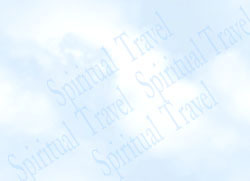 The term travel focuses not only on states but also on stages and transitions between mental or spiritual states. The spiritual traveler moves between spaces or states sometimes in a continuous movement, and sometimes in rapid transitions in a step-like fashion. Thus, the travel analogy tries to capture the dynamic richness of the inner worlds of perception. It attempts to do justice to the changing geographies and textures of these inner spaces. It is also able to do so without the limitations of the more static "state-based" terminology. Clearly, the travel analogy breaks down when the person enters the more extreme states of mystical awareness. However, even in these states of infinite light and cosmic nothingness, there is usually some series of different states leading to the advanced state which is beyond all qualities and descriptions. This is evident in the spiritual travel experiences presented in the Sacred Light section of this site. A classic example of spiritual travel is the story of Buddha's enlightenment from a second century CE text, the Buddhacarita by Asvaghosa. Buddha, prior to his experience of enlightenment, reexperienced his thousands of previous lives during the first watch of the night. The text says he remembered his previous lives "as if living them over again". On the second watch, he saw the workings of karma and reincarnation, and nature of causality in the world. It was not until the fourth watch that he actually achieved enlightenment. The fact that he entered fully into his past lives strongly suggests that he was out of his body, and unaware of the surrounding sensory environment during this period of remembering. He spent the entire night "traveling" through a whole complex of inner states to finally reach the state of Nirvana at dawn.